Before implementing any treat into your dog's diet, you must first consult with a veterinarian. According to PetEducation.com, acceptable treats vary from dog to dog dependent upon the type of crystals forming in your dog's bladder. Your vet may recommend specific treats to assist in reducing or dissolving the bladder stones. Fortunately, there are several treats available to choose from. Royal Canin offers Urinary Dog Treats which are often permitted even to dogs who are on a medicinal kibble. Royal Canine Dog Treats are based on veterinary science and are veterinary-exclusive. Dogs who are on the Royal Canin Urinary Diet require a prescription from the veterinarian before ordering. The Royal Canin treats work by promoting an environment that is unfavorable to the development of bladder stones. Also, the company claims their food can help with the formation of struvite crystals. The treats are appropriate for all dogs regardless of age, and the first ingredients in the list include brewers rice, corn and chicken fat which makes this high-quality product. 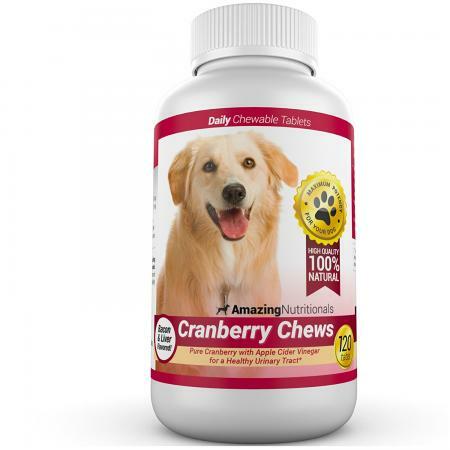 Amazing Nutritionals Cranberry Chews are easy to chew and may allow a dog to be taken off her medication. The treats are bacon and liver flavor, so many dogs are attracted to their smell and taste, making them a great alternative for dogs who have difficulty ingesting their medication. Remember though, these treats are medicinal and can only be taken in certain quantities. The chews work by flushing bacteria from your dog's body and reducing inflammation. The company is so confident in the treats' efficacy, it will provide a full refund if you do not notice an improvement in your dog's health in 28 days. The treats contain no by-products or wheat and are acceptable for all life stages whether your dog is a puppy, adult or senior dog. 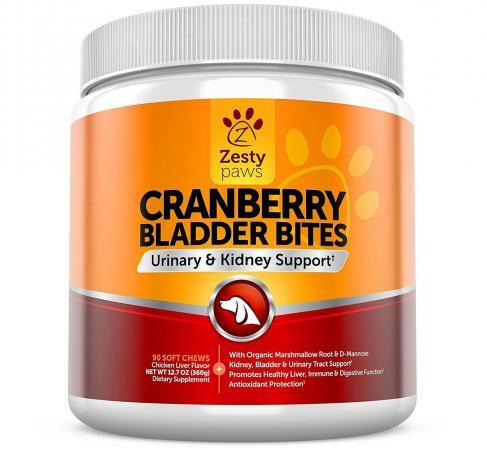 Zesty Paws Cranberry Bladder Bites promote kidney and bladder health by balancing the pH of your dog's urine with organic ingredients. According to the explanation of ingredients on the company's website, the cranberry ingredient in this treat also promotes a healthy immune system, allowing your dog to fight any bacteria within his body. The organic licorice root in the treat assists with detoxing the kidneys while the Nettle Seed herb reduces inflammation and reduces discomfort while urinating. These treats are also chewy which means they can be consumed by all ages of dogs. The company offers a money-back guarantee if you're not satisfied. 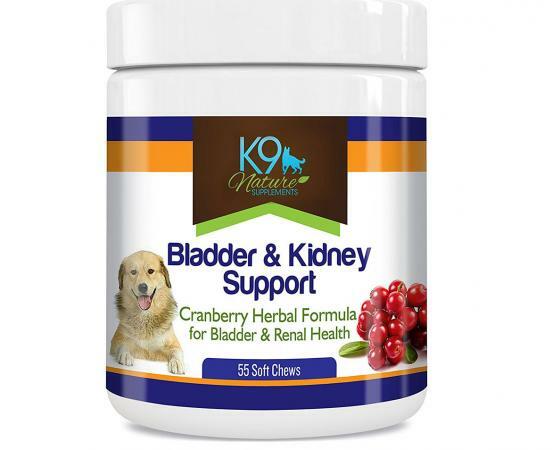 K9 Nature Supplements offer a Bladder & Kidney Support Treat which come as a chewable. Not only are these treats recommended for bladder stones but also for kidney failure, frequent urinary tract infections and incontinence. The chewables have a combination of cranberry powder and herbs to help reduce inflammation and provide relief for your dog's discomfort. This treat also works by decreasing the risk of bacteria buildup within your dog's body. K9 nature supplements is especially helpful for senior dogs who experience difficulty ingesting a pill. Animal Pharmaceuticals offers UTI-DOG Healthy Treats which contain cold-pressed cranberry seed oil. This provides your dog with a significant amount of fatty acids and antioxidants. The cranberry seed oil utilized in this product is derived from whole organic cranberries. There are no chemicals, solvents or heat used to extract the oil from the cranberry which increases the nutritional value in each treat. Another important ingredient in this treat is grapefruit seed extract. The grapefruit seed extract alleviates the symptoms from urinary problems. The treat also contains probiotics to enhance the immune system of your dog. 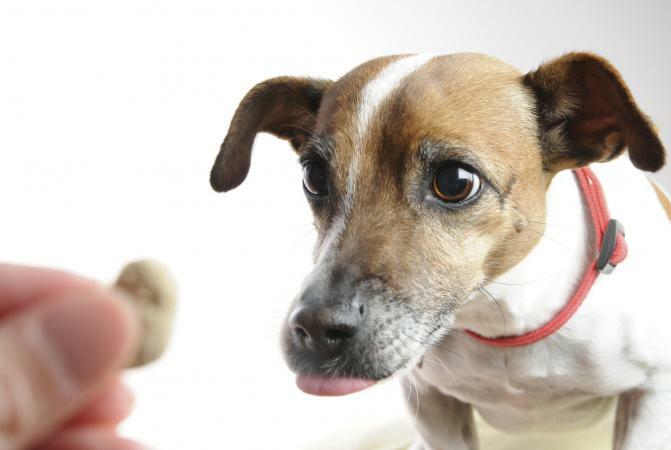 There are specific restrictions associated with treats for bladder stones. Bladder stone treats that are pH neutral should not have a significant effect on the pH of the urine. High-protein treats, such as lean chicken or turkey meat can assist with a neutral pH level. Urate stones are the least common type of bladder stone in dogs. According to VCA hospitals, vets generally recommend a diet low in purines in addition to using wet food to increase water consumption in an effort to prevent future stone development. The key component in preventing the formation of urate stones is maintaining a neutral urinary pH. This means the pH of the urine to prevent urate stones should be right around pH 7. You can test your dog's urine by purchasing pH strips at a local drugstore. There are two types of calcium oxalate crystals found in dogs: calcium oxalate dihydrate and calcium oxalate monohydrate. Calcium oxalate monohydrate crystals are formed when a dog ingests a poison, like antifreeze. The calcium oxalate dihydrate crystals are those which often form from an acidic urine. Avoid non-alkaline vegetables such as strawberries, carrots, celery, collards and leeks if they have calcium oxalate bladder stones. These vegetables will disrupt the proper urinary pH and may result in additional calcium oxalate crystals forming. You must ensure the foods your dog is eating are not high in oxalates and encourage water consumption. Fresh or dried cranberries have also been found to assist with the prevention of crystal formation in the urine. Cranberries have been found to contain an agent which prevents the adhesion of bacteria in your dog's urinary tract. Commercial treats containing cranberry are also often helpful. If your dog is suffering with bladders stones, you should first consult with your veterinarian before giving him any treats. Each dog is different and based on the composition and size of the bladder stones, as well as your dog's history, your vet may recommend particular treats. It is important to note bladder stone treats may eliminate the need for bladder stone medication. Consequently, you should follow the recommended dosage on your product's labeling. You should also refer to your veterinarian for dosage instructions as dosage is also on a case-by-case basis. If you see a treat which you are interested in providing your dog, bring your veterinarian the description of the treat as well as the ingredients included within the treat for approval. Failure to consult your veterinarian could result in serious health effects.